Research studies indicate that telomerase gene therapy may not only reverse Alzheimer’s Disease and other dementias, but it may even protect people from developing such diseases. 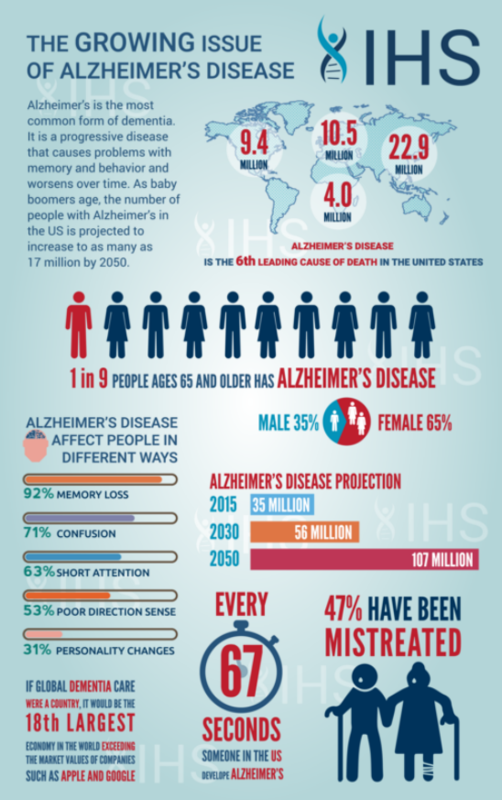 This is indeed hopeful news for the nearly 50 million victims of Alzheimer’s or related dementia worldwide as well as for the millions of aging people with Parkinson’s and aging-related mental decline. Telomerase gene therapy appears to rejuvenate microglial (the immune cells of the brain) cells in Alzheimer’s Disease according to promising research study data. Neurons (nerve cells) are the primary components of the central nervous system (CNS). Neurons connect to each other to form neural networks, and communicate via electrical and chemical signals at specialized connections called synapses. There are over 100 trillion synapses in the human brain. The brain is about 10% neurons and 90% neural network support cells, called neuroglia, or glial cells, which surround and insulate neurons, protect them from damage, and supply them with nutrients and oxygen. Neuroglia are often found to malfunction in neurological disorders such as Alzheimer’s Disease or amyotrophic lateral sclerosis (ALS). Telomerase is an enzyme that protects the ends of chromosomes, called telomeres, which are otherwise shortened each time cells divide. In adults, most cells in the body no longer express telomerase, and so their chromosomes become shorter and cells age (become senescent). Telomerase gene therapy appears to rejuvenate a subtype of glial cells, called microglia, which act as the first and main form of active immune defense in the central nervous system (CNS). These cells mediate immune responses in the central nervous system by clearing toxins, microbes, cellular debris and dead neurons from nervous tissue through a process called phagocytosis (cell eating). They also help in the formation and pruning of synapses. In addition, there is mounting evidence to indicate that telomerase plays an active role in protection from Tau pathology, an accumulation of malfunctioning protein aggregates (plaques) seen Alzheimer’s disease. Integrated Health System’s gene therapy targeting neurodegeneration utilizes an adeno-associated virus (AAV) vector platform, modified for the enhanced telomerase gene therapy delivery to neural tissue. The genes to treat the disorder are inserted into the virus, which then delivers the genes of interest to the patient’s cells. In recent years AAV gene therapies have been tested in humans with great success and no evidence of adverse effects has been reported. There are numerous clinical trials currently being conducted with AAV gene therapy for many diseases. IHS doctors are here to help you at every step in your journey to health. To schedule your 15 min or 30 min consultation with a doctor from Integrated Health Systems please click the link below. Please note that the default length of an appointment is 15-min, so if you would like a 30-min appointment please select two simultaneous slots. Please note that a 15-minute consultation rate with our doctor is $100 USD, and a 30-minute consultation rate is $200 USD. If you choose to receive a treatment from us we will deduct the cost of the appointment from your treatment costs. Finally, once you have secured an appointment, we will send you an invoice for the appropriate amount. Please pay this invoice within 24 hours of reception. Otherwise your appointment will be cancelled. of his interests. For several years, he did research with adenoviral vector technology used to treat cancer. He was selected for the RSNA Research Fellow Award. He has completed training in image guided cancer and spine procedures, and is board certified by the American Board of Radiology. He has research interests in gene therapy and stem cell reprogramming, as well as using CT and MRI for minimally invasive procedures related to the spine and cancer. We have already started to test telomerase gene therapy to rejuvenate microglial cells in our Alzheimer’s Disease trial, building on promising research study data. Kronenberg, Golo, et al. “Repression of telomere-associated genes by microglia activation in neuropsychiatric disease.” European Archives of Psychiatry and Clinical Neuroscience (2016): 1-5. Panossian, L. A., et al. “Telomere shortening in T cells correlates with Alzheimer’s disease status.” Neurobiology of aging 24.1 (2003): 77-84.